You should not edit any files in the IDE installation directory. Instead, you can customize the attributes by creating your own .properties or .vmoptions files in the following directories. (This has been possible on some platforms before, but it required you to copy and change the entire contents of the files. With the latest changes these properties are now additive instead such that you can set just the attributes you care about, and the rest will use the defaults from the IDE installation). 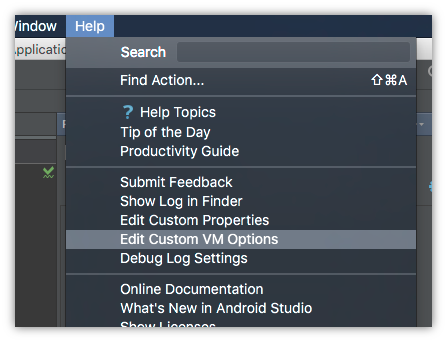 Note: As of Android Studio 2.0, you can create/edit this file by accessing the "Edit Custom VM Options" file from the Help menu. Note: The folder name depends on the version of Android Studio. The documentation below applies to the release version (1.1.x), but if you are on a different version of Android Studio, see the table below for the correct folder name for your version. If you want to override an IDE property, create a new idea.properties file in your local config directory, where you specify just the override properties. This file will be merged with the default properties in the IDE. See the below list for various properties you can change. On a Mac, for Android Studio 2.0 Preview, copy this file to ~/Library/Preferences/AndroidStudioPreview2.0/idea.properties. Around 1.0 we switched from storing VM options in a file called idea.vmoptions to one called studio.vmoptions, to avoid clashing with IntelliJ installations. If you had created a file named idea.vmoptions for Studio, it will be ignored now. Put your edits in studio.vmoptions instead. # This option controls console cyclic buffer: keeps the console output size not higher than the specified buffer size (Kb). # Use default anti-aliasing in system, i.e. override value of "Settings|Editor|Appearance|Use anti-aliased font"
# option. May be useful when using Windows Remote Desktop Connection for instance. # algorithm to provide a custom system DPI. # The options are not supported on Mac, as Retina support is built-in. # where <dpi_value> can range from 96 (100% zoom), to 288 (300%) zoom.